Netanyahu at the Conference of Presidents: Iran is getting closer to the red line I set at the United Nations. Iran is taking steps that are bringing it closer to the “red line” in its nuclear program that Israel cannot tolerate, Prime Minister Binyamin Netanyahu warned on Monday. 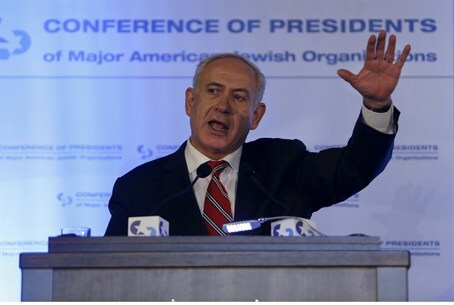 Speaking at the Conference of Presidents of Major American Jewish Organizations, Netanyahu said, “The three external challenges that we face begin with Iran. I spoke about Iran’s plan to develop nuclear weapons. Its nuclear weapons program continues unabated. It’s focused on enrichment because if they can continue and complete the enrichment of high enriched uranium, then they’ll have enough to produce enough material to produce a nuclear bomb. Netanyahu said, “How do you stop it? Well, you have to put greater pressure on them. You have to upgrade the sanctions. And they have to know that if the sanctions and diplomacy fails, they will face incredible military threat. That’s essential. Nothing else will do the job. And it’s getting closer. Netanyahu then referred to the peace negotiations with the Palestinian Authority and said that the framework for talks should be his Bar Ilan speech in 2009. He also called on PA Chairman Mahmoud Abbas to resume negotiations without setting preconditions. “And we have a third challenge, which is to advance a solid secure peace with the Palestinians,” he said. “I believe that the framework for this peace is what I outlined in my speech in Bar Ilan University: two states for two peoples – a demilitarized Palestinian state that recognizes the Jewish state. I think to reach this solution we have to negotiate in good faith. Negotiating in good faith means you don’t place preconditions. He added, “These three great challenges, Iran, Syria and the pursuit of peace, are three of the main subjects that I intent to take up with President Obama when he comes here to visit Israel. I welcome him, I think this is a wonderful opportunity to reaffirm the strategic relationship between Israel and the United States. We have a great alliance. This is an opportunity to strengthen this alliance. I look forward to welcoming President Obama here in Jerusalem, here in Israel.